From the outside, the entrance to the Domus Aurea is unassuming. Misleadingly so. Buried underground (and with other structures, including Trajan’s baths, later constructed on top of it), the Domus Aurea was largely forgotten until its rediscovery in the 15th century. Visitors included the artists Perugino, Ghirlandaio, and Raphael — all of whom were inspired by the palace’s frescoes and decorations and whose resulting work helped shape the direction of the Renaissance. But the Domus Aurea has struggled since then. Among the biggest issues has been water drainage: whenever it rained hard (and sometimes when it didn’t), water would soak through the park, right above the Domus Aurea, into the palace’s 2,000-year-old ceiling. The site closed in 2005; it reopened in 2007, but out of concerns for visitors’ security, was closed again almost immediately. And in 2010, after heavy rains, a 645-square-foot section of the ceiling caved in. Just some of the lovely stucco decorations, still with original colors intact, that grace the Domus Aurea’s galleries. When I heard about the latest collapse, I figured the Domus Aurea would never be properly restored enough to recover. And I definitely didn’t think they’d be opening any Domus Aurea tours anytime soon. But sometimes, Rome surprises you. 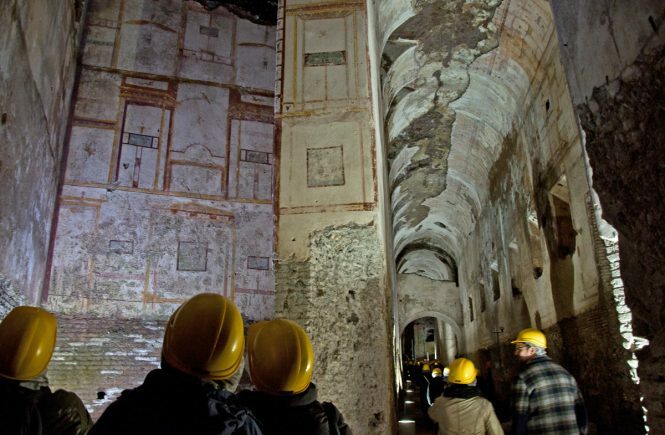 And, while seven years isn’t exactly “soon,” the Domus Aurea has (partly) reopened. And it is being restored, to the tune of $39 million. (One of the projects underway is a plan to decrease the weight, and burden, of the park above on the ancient structure below). And! 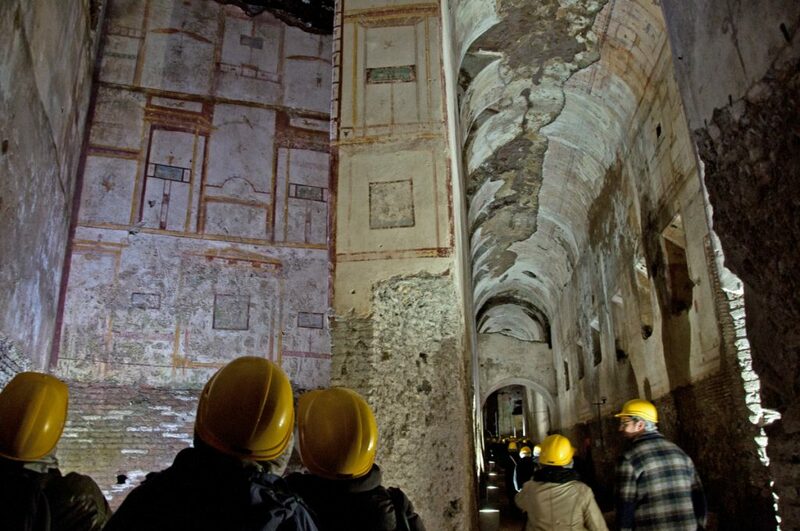 Yes, you can now do a Domus Aurea tour. Even though the restoration remains underway, sections that have been secured, including an enormous octagonal, domed room, long galleries and rooms with plenty of frescoes and stucco, are open to visitors on guided tours. 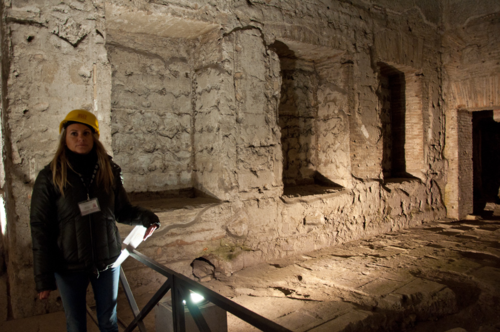 Our archaeologist/tour guide leads us through the Domus Aurea’s long-hidden rooms. I went last week, and it was fantastic. 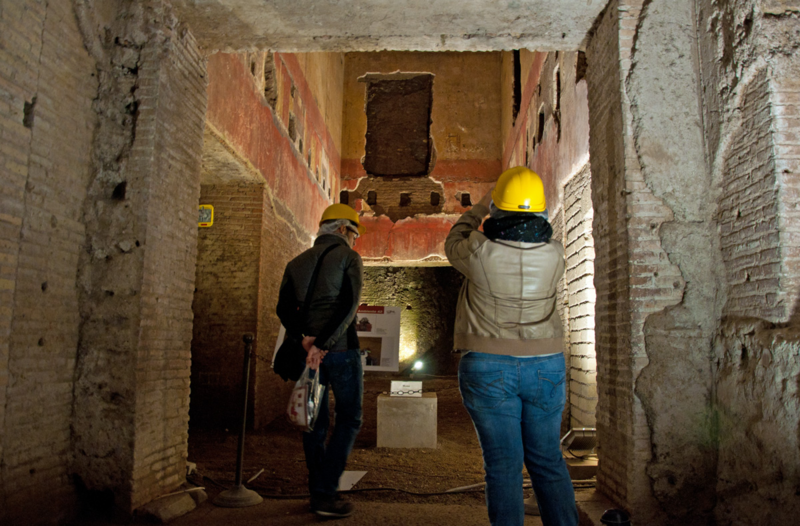 The Domus Aurea tours are led by archaeologists working on the site. Although the guides don’t go into the juicy stories and anecdotes they could include (a general problem with tours run by the sites themselves, I’ve noticed, is that the guides tend to focus on raw facts, timelines and archaeological details, not on the nutty stories that can bring the sites to life), they really know their stuff. Plus, there’s nothing like being led, hard-hat in place, through an opulent, 2,000-year-old palace that has been pretty much off-limits for the past 15 years. Tours, which must be pre-booked, take place only on the weekends until March 8 (March 2015 update: They’re now running through August!) (April 2016 update: now until June 2016… likely to be extended!) (March 2017 update: the tour is now regularly run in English, Italian, Spanish and French, on Saturdays and Sundays only; it costs €16 each to reserve and now includes a virtual-reality headset to bring the site to life). 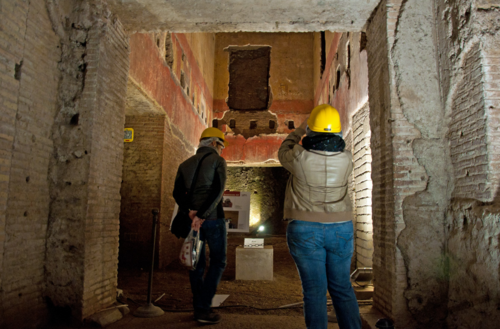 You can book your Domus Aurea tour online here. 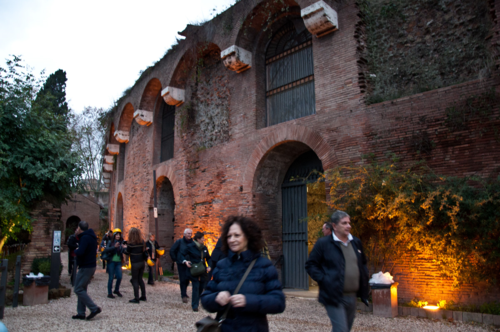 Since the entrance is on the Colle Oppio, right across from the Colosseum, and since the Colosseum was built on the Domus Aurea’s former lake, I recommend doing both in the same day — the two sites together will give you a great sense of Roman history in its first two centuries of empire. The google maps marker for Domus Aurea is in the wrong place, causing some (myself included) to get lost looking for the entrance and miss their tours. Since it isn’t signposted and as you say, the entrance is “unassuming” it might be good to point this out in big bold letters, since the people running the show don’t seem to care whether you find it or not. I was there the second weekend of October 2016. It is a fantastic experience and I really enjoyed the guide. I wish they would get their act together, though, and hire an experienced fundraiser rather than depend on 20-person tours to get the word out about crowd-funding. 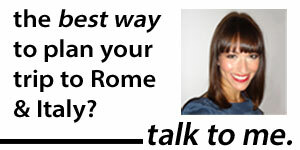 I highly recommend adding this stop to your itinerary in Rome. They have recently reopened the Domus Aurea for 2017 tours and this year they’re going through with digital reconstructions of it that you view through an Occulus Rift head set. I’m seeing it next week and I’m super excited. That sounds amazing, Nick — let me know how it is! I haven’t gotten a chance to try it yet! Have just been. It is remarkable, the Occulus Rift 3d glasses bring it to life in a truly emotional way. I have been to many ancient sites and seeing the potential of this new technology to connect us to the sites and our past is staggeringly exciting. Hi Teresa! I’d check directly at the coopculture.com website — it’s the first place you’d find any updates of a schedule, since it’s the official site. I hope that helps! pls. add to me to your email list! I presume the schedule for the rest of 2018 (after 26 August) will be published soon. We will be in Rome 11 to 14 October 2018. Do we presume correctly? 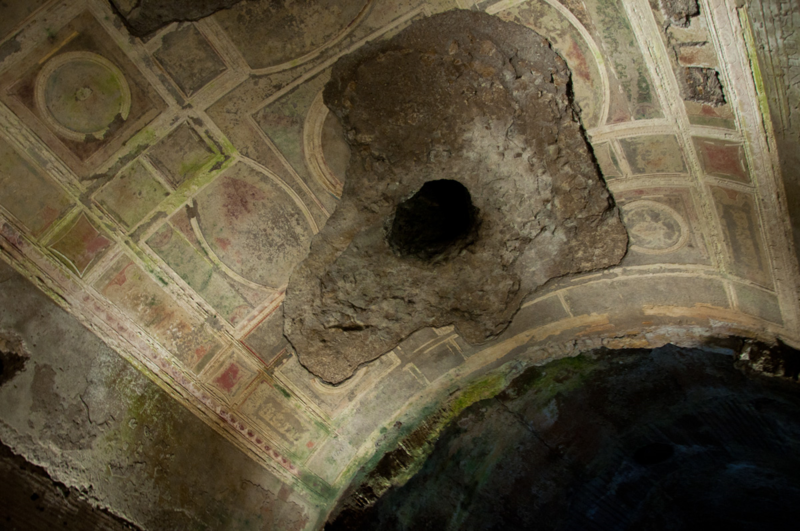 Domus Aurea is definitely on our “must see” list so we are keen to get tickets. Yes, it should! But it looks like they’re still offering Saturday and Sunday only, I’m afraid. If you go, let me know how you enjoyed it!